Remember when Cleveland Cavaliers fans were upset when LeBron James took his talents to South Beach? Or when the Orlando Magic faithful or Los Anglees Lakers fans were glad to see Dwight Howard leave town? Well, now it’s once-Yankees fan favorite Robinson Cano facing the wrath after reports hit that the five-time All-star Second baseman agreed to a megadeal with the Seattle Mariners. 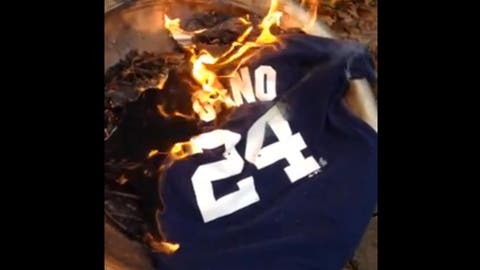 After all, you can’t expect anyone to actually burn the Yankee pinstripes, can you?